The hardest part to becoming a Twitter regular is developing the habit of using it. 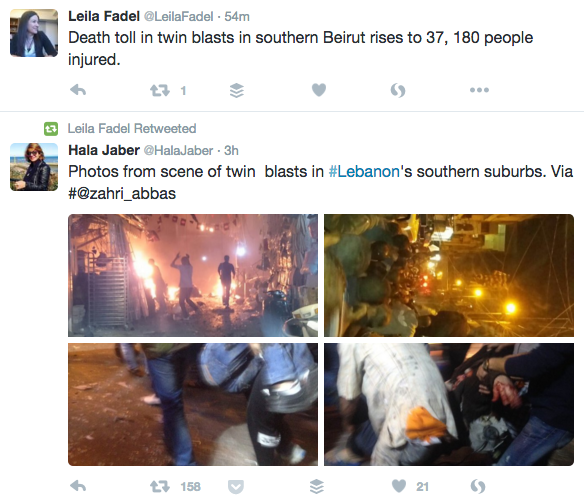 Every journalist today should be on Twitter — the excuses are few and the benefits are many. It’s not just a place to share and find stories. 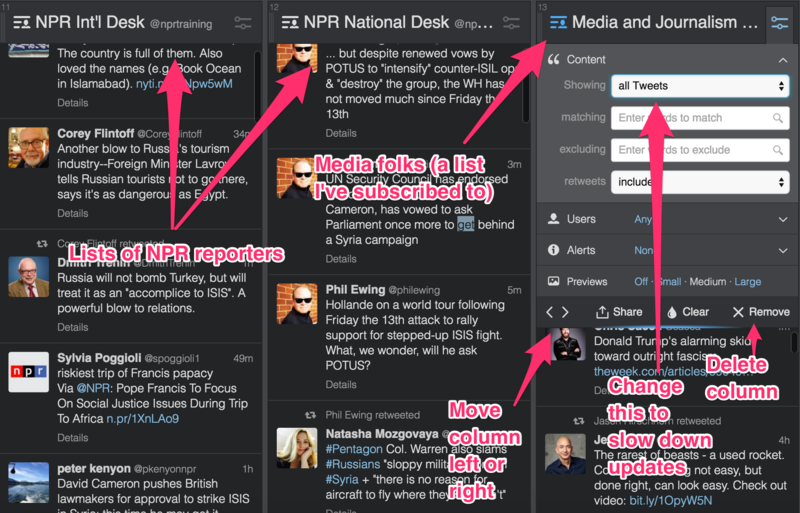 You can also use it as an alternative to the news wires and/or to find sources. It’s also a platform in its own right for unique journalism and storytelling. If nothing else, the practice of writing short (in 140 characters or less) is great for your radio scripts, too. Before we go any further, answer this question: What are you using to tweet and follow Twitter? If it’s just twitter.com, you may want to reconsider. A tool like TweetDeck (owned by Twitter) or HootSuite will make the difference in your Twitter usage. Both of them allow you to keep eyes on different parts of Twitter at once, such as your mentions, new followers, lists you’ve created, hashtags and much more. I personally recommend TweetDeck, especially since you sign in with your Twitter credentials. You can download the desktop app (no mobile version, sorry) or keep tweetdeck.twitter.com open in a web browser tab all day. Just like you have to go to the gym regularly to see results, you have to tweet regularly to build your Twitter muscles. By completing a couple of the varied “exercises” listed below every day, you may find that Twitter opens up to you in a way it hadn’t before. You may also learn something, including how to build Twitter into your day-to-day workflow, follow news events, find sources, and discover new ways to report and share your stories. 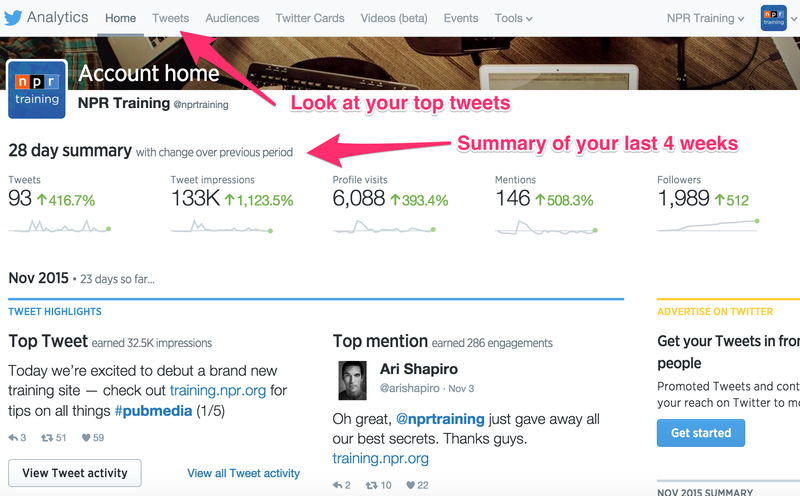 Your technique will get better over time, especially if you use Twitter’s built-in metrics tool to learn what works — and what falls flat. The assignment: Every day for one week, do at least five things from the list below. Strive for diversity and try to get something in every category over the course of the week. You can (and should) repeat this “assignment” indefinitely until it all becomes second nature. Don’t panic if you don’t know what these things mean — each item on the list is explained in greater detail (with examples) below. Use quotable, image, gif, etc. Twitter lists are an easy way to follow different subjects over time. Regional lists, topical lists or those based on a hashtag (like #BlackLivesMatter) can help you stay in touch with the pulse of something you have a long-term interest in. They’re also a great way to find pitches. For example, you might create lists for: baseball, drones, food safety or Cincinnati. Public lists can be shared with anyone. If you add someone to a public list, they will get a notification. Private lists cannot be shared but people on the list won’t know about it. 1. In TweetDeck, click the “+” symbol on the left of the screen. You shouldn’t save your tweeting for when a story is done. Think about different ways you can share insights during the reporting process. 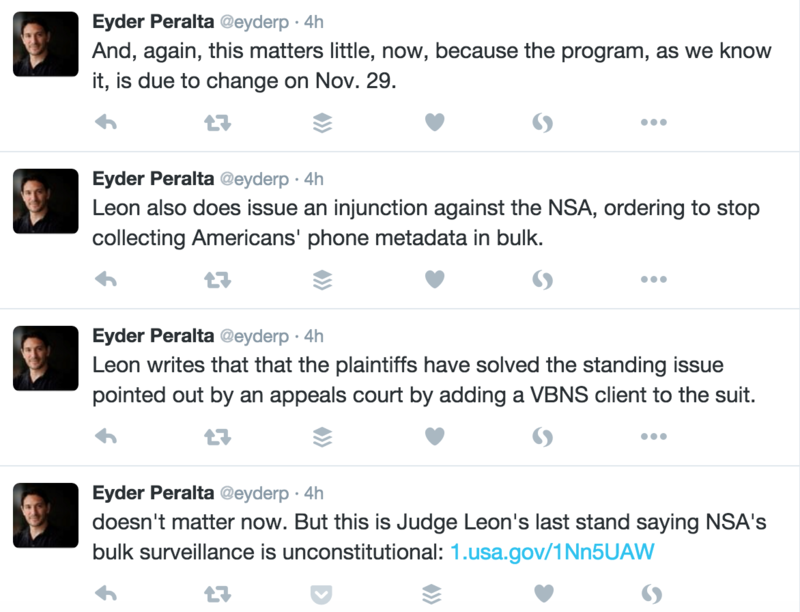 NPR’s Eyder Peralta (read from the bottom up) published this string of tweets after a circuit court opinion was released. If you don’t have a particular beat, try sharing things that are relevant to the region you cover. There are a couple of ways to go about this — you can search for people who are already tweeting or you can try to have those people come to you. For the former, check out this six-part exercise that will teach you how to find sources based on their location (via geotagged tweets) or keywords in their messages. Otherwise, you can find people with a callout. It can be very low-tech. (The one below helped NPR’s Sam Sanders Sam find two people for this story). Have u ever bought anything from a presidential campaign’s online store? Why? Lemme know if ur game to discuss for an @nprpolitics story. For other ideas, check out this post, 6 ways to use social callouts. Twitter is a great place to reach out to sources — especially those who seem to ignore your phone calls and emails (cough, cough). There are two ways to do it. In the example below, Sam tweeted at Alicia Garza. While it was a public post, it probably did not show up in many places since it’s considered a “reply” (like a sidebar conversation). Direct messages are a private way to do the same thing. It used to be really easy to mess up when sending a private direct message (DM). Some people got into a lot of trouble that way. It’s a lot simpler now (read Twitter’s guide). Direct messages are a good way to get phone numbers and other details from sources when you don’t have an email address for them, although you can generally only DM someone who follows you back. I know one reporter who communicated with government sources exclusively via DMs because, unlike emails, they aren’t subject to public records rules. Every story yields way more material than you could possibly fit into the final product. But that doesn’t mean you should trash the leftovers. Try sharing a behind-the-scenes photo from the field, an extra fact or spare anecdote. You can post it while you’re reporting and after the story is finished. If you’re looking for similar content, check out NPR’s On The Road Tumblr. Twitter changed its stars to hearts. The same sentiment applies, though — heart away. Hashtags are a way to (loosely) organize conversation around a topic. They often emerge during breaking news and televised/live events. In the tweet below, #ysltf stands for “You should listen to, Friday,” a hashtag for sharing good audio content that’s used on Fridays. Want more? Check out this post on hashtags. Most questions asked on Twitter are rhetorical (“Are you kidding me?”) but they don’t have to be. You should not be a tweeting/retweeting robot. Asking questions is an easy way to engage with the people who follow you and grow your following in general. You can pose a question as part of a structured Twitter chat (like the example below), but you don’t have to. In either case, you may find the ensuing conversation yields a story in itself — like it did in this Code Switch example. Check out this post for more advice on how to run a good Twitter chat. Twitter introduced a polling feature in 2015. The polls are pretty straightforward and a very easy (but unscientific) way to get a quick take on something. Note that you can currently only create a poll on Twitter.com and in the Twitter app. Don’t write a lazy tweet where you just copy/paste the story’s headline. Try to pull out an interesting takeaway or quote. You should also include a link. It doesn’t matter if it’s a short link (e.g. http://n.pr/1NYAJw6) or the full URL — Twitter “charges” you for the same number of characters. The short video below demonstrates how to schedule tweets in Tweetdeck. You can also do it on Twitter, but it’s slightly more complicated. Use a quotable, image, gif, etc. It’s a fact: Tweets with media (images, animated gifs, videos) usually receive much better engagement than text-only tweets. It makes sense — don’t the two below stand out in a Twitter stream? If tweeting an image, make sure you have the proper permissions to do so. You should include credit to the photographer and/or publication that ran it. You are more than your job! It’s a good idea to put some of yourself into your Twitter feed, whether it’s about your family, hobbies or just general observations from life. It humanizes you. Keep it light, though — no one wants to see a million photos of your dog. Nervous? Read the social media section of NPR’s Ethics guide about what to do — and what to avoid. … and then comparing the results. Which was retweeted more? Which had more likes? Sharing a story multiple ways like this helps you learn what works through trial and error. For more inspiration, check out this WHYY presentation on 10 Ways to Tweet and then take this great quiz from the New York Times: Can you tell what makes a good tweet? Twitter makes it really easy to see how you’re doing with their analytics dashboard. Try to look at it weekly so you can start to learn what’s working — and do more of that type of tweeting in the future.